Cardinal Wolsey (1470 or 1471-1530) sadly ended his days being hounded by King Henry VIII and died in Leicester en route to London following his recall from York to be tried for treason. It hadn’t always been so as Wolsey had spent much of his life and good fortune entwined with the Tudors despite being born the son of a butcher in Ipswich. Thomas Wolsey – by Jacques le Boucq (1520-73) circa 1550. This drawing is thought to be a copy of a lost portrait dated 1508 when Wolsey was in his late thirties and a royal chaplain. Thomas Wolsey – unknown artist 1589-95. This oil on panel painting is a later copy of a lost original work painted about 1520 when Wolsey was at the height of his power. He’s shown in his cardinal’s robes. Thomas Wolsey was clever and after attending Ipswich School he studied theology at Magdalen College, Oxford. Henry VII had made Wolsey Royal Chaplain, but when Henry VIII came to the throne in 1509, Wolsey’s intelligence, administrative competence and diplomatic skills began to be recognised and rewarded. He rose through the ranks, both ecclesiastical and secular, to become Archbishop of York in 1514, Cardinal in 1515 and Lord Chancellor of England from 1515 to 1529. And, he was passionate about the role of education creating the Cardinal’s College of Mary, Ipswich and Cardinal College, Oxford, although neither of which outlived him in their original form. Rampant griffin detail at the head of the Charter of Foundation of Cardinal College, Ipswich. Despite all his accomplishments Wolsey ended his days in disgrace and was buried in ignominy in Leicester Abbey without a significant, grand monument to mark his burial. In fact Wolsey had been overseeing arrangements for his eternal resting place including a design for a sarcophagus and accompanying sculptural adornments some six or so years before his death. Proposed arrangement for the tomb of Cardinal Wolsey as imagined by a Victorian Mr Somers Clarke, Architect to St Paul’s Cathedral in 1894. By 1524 the sarcophagus had been made and the Florentine Renaissance sculptor, Benedetto da Rovezzano, was commissioned to create four bronze angels to complete the monument. Wolsey’s black touchstone sarcophagus eventually used for the monument to another national hero, Admiral Lord Nelson, and installed in St Paul’s Cathedral, London. However, despite these exquisite Renaissance angels being sculpted and cast by 1529 a year before the Cardinal’s death, the full memorial tomb was never assembled and erected in its entirety as . . . . . The Wolsey Angels by Benedetto da Rovezzano. Bronze about 1 metre tall. 1524-29. Claimed by King Henry VIII on the Cardinal’s death, hidden, dispersed and lost until reunited again in 2008.
unfortunately for the Cardinal he dramatically and cataclysmically fell from the King’s favour following his failure to obtain a divorce from Pope Clement VII permitting Henry to escape his marriage to Katherine of Aragon. One of the two Wolsey Angels found in 2008 mounted on gateposts at the entrance to Wellingborough Golf Club, Northamptonshire. They joined the other two which had surfaced at an auction in 1994 simply listed as ‘in the Renaissance style’. The pair were subsequently attributed by the Italian scholar Francesco Caglioti to be Wolsey Angels by Benedetto. There may not be the grand tomb in Westminster Abbey for Cardinal Wolsey that he had envisaged, but there is an engaging tribute to Wolsey in his home town of Ipswich. It is a commemorative statue by David Annand that I hope Wolsey would have deeply appreciated as it depicts him not only as the Cardinal, but gesticulating, as if in full flow, educating the world (or at least the good folk of Ipswich as they stroll up St Peter’s Street). Thomas Wolsey by David Annand. Bronze. 2011. The text running round the plinth reads ‘Thomas Wolsey born in Ipswich 1470 or 1471 died Leicester 1530 Cardinal Archbishop Chancellor and Teacher who believed that pleasure should mingle with study so that the child may think learning an amusement rather than a toil‘. This follows on from last week’s post, ‘John Berger – Look again’. Earlier this week, on January 2nd 2017, I heard the news that John Berger had died in Paris at the age of 90. There can’t be an art historian anywhere that does not know his work ‘Ways of Seeing’ as, along with Walter Benjamin’s ‘The Work of Art in the Age of Mechanical Reproduction’, Berger’s commentary on art and imagery encouraged people to reappraise and rethink the way they looked at the world. John Berger wasn’t simply an art critic, he had originally trained as an artist at the Chelsea School of Art, but became an influential, intellectual voice through writing criticism, novels (he won the Booker Prize for ‘G’ in 1972) , poetry, screenplays and many non-fiction texts. It was, however, his fascinating BBC television series “Ways of Seeing” that established his presence in the 20th century Western cultural canon. I am too young to have seen this series the first time round, but all four, half-hour episodes are available to watch on YouTube – Ways of Seeing. The iconic television series spawned the book. I still dip into my copy every now and then when the world of ‘visual media’ and its hysterical commentary feels like its spinning out of control. In ‘Ways of Seeing’ I am intrigued by the three pictorial essays that are somehow mutable. Each time I return to them different interpretations come to mind. Our principal aim has been to start a process of questioning. This quotation, found at the beginning of the book, is the last sentence from ‘Notes to the reader’. Personally, I find the pictorial essays invite questions immediately. Without a guiding text a sequence of images can offer a story which we decode internally, non verbally, generating a response we interpret from our current cultural perspective. Sometimes we might look at these essays, work to extract conscious thoughts, devise a narrative that we then articulate, but not always. For me, periodically I have returned to these compositions aware of changes in my viewpoint. Then, having considered and acknowledged a newly adjusted outlook, I find the process of questioning begins again. For an excellent overview of John Berger’s extensive and varied achievements please take a moment to read Gerry Cordon’s piece. Art for Christmas cards anyone? Years ago I received a charity Christmas card which featured what I took to be ‘The Three Wise Men’. Last month, at the Pinacoteca di Brera in Milan, I saw the very large Gentile and Giovanni Bellini painting, ‘St Mark Preaching in Alexandria’. This painting had originally been started by Gentile Bellini, but following his death it was completed by his brother Giovanni. It is a fascinating Renaissance Venetians’ version of an imagined Islamic Alexandria. ‘St Mark Preaching in Alexandria’ by Gentile and Giovanni Bellini. Oil painting circa 1504-07. 3.47m x 7.7m Pinacoteca di Brera, Milan. Whilst photographing some of the captivating detail, displaying both the vivid imagination and skill of the Bellini brothers, I noticed three bystanders in non-Western dress. Here were my Christmas card kings. There has also been a fashion for embossed, golden cards for Christmas. I’m not sure if this version of St Peter by Crivelli has been used yet, but the relief work depicting the keys and crosier could easily be embossed. Perhaps St Peter is looking a touch too joyless for Christmas. St Peter part of the Madonna and Child with Saints, San Domenico Triptych. Carlo Crivelli 1482 Tempera and oil on wood. Pinacoteca di Brera, Milan. A small amount of gilt and glitz is acceptable at Christmas, but I think I prefer the more muted colours of frescoes. How about this fourteenth century painting by Simone da Corbetta. It fits the bill visually and would appeal more to a 21st century sensibility with the wan-faced, tall and thin female saints. Part of medieval painting – Madonna and Child (not shown), St. Catherine, St. Ursula, St. George and the donor Théodorico da Coira by Simone da Corbetta. 1382 Fresco transferred to canvas (235cm x 297cm) now at the Pinacoteca di Brera, Milan. And, finally, there’s plenty of inspirational, ornate sculptural work hidden away in churches. However, church interiors are frequently gloomy and a tripod (not popular with guides and security) is often required to capture an interesting, potential Christmas card image in focus or, maybe, not quite! The Virgin Mary in Heaven – detail of relief in the church of Santa Maria delle Grazie, Milan. Author agnesashePosted on December 15, 2016 Categories Art History, Visual Culture as InspirationTags art, art history, Carlo Crivelli, Christmas, Christmas cards, Gentile Bellini, Giovanni Bellini, inspiration, medieval, Renaissance art, Simone da Corbetta, St Mark preaching in Alexandria9 Comments on Art for Christmas cards anyone? 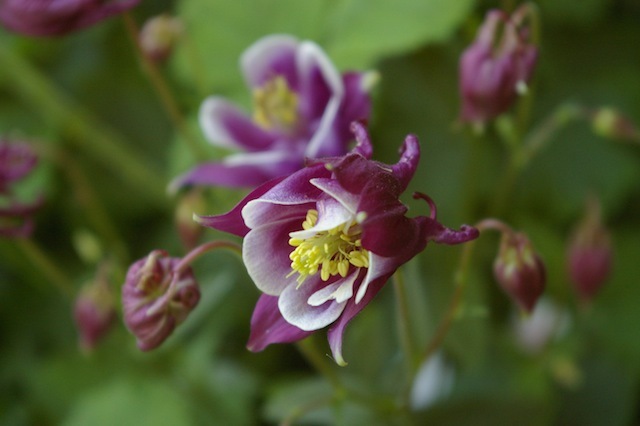 Long the love of monks scratching away in the scriptorium, the aquilegia, known to medievalists and monks alike as the columbine, has decorated scores of illuminated manuscripts. 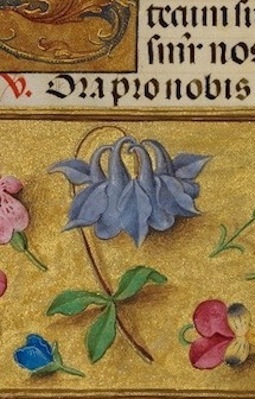 Exquisite aquilegia from Saint Dominic illuminated page. 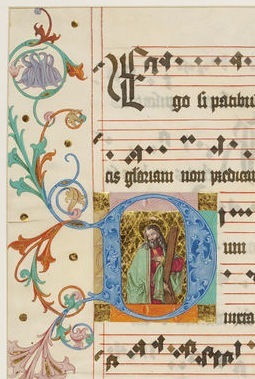 Aquilegia part of the border decoration of a medieval antiphoner. 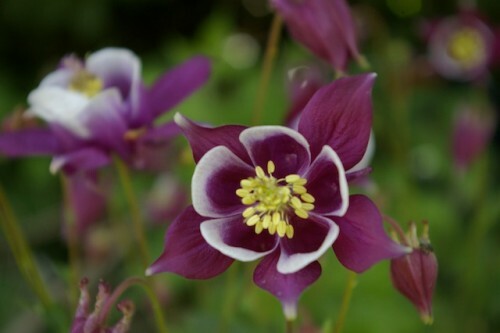 The various shapes and colours of aquilegias offer plenty of combinations to get the creative juices flowing. Their form can be rendered into simple, quite graphic representations. They are shapes I often return to. Hello, hello – spot the fly! My friends know I enjoy down time in the garden and little garden gifts are much appreciated. I always plant out everything I’m given, but sometimes the colours don’t fit well with a particular planting. This situation at first may appear disappointing, but in general, it is a bonus as I don’t feel guilty when I immediately cut them for the house. Every spring these striking red and yellow tulips (tulipa Gavota) return and, despite plenty of background green, do not fit with the main pink, white and orange display in the back bed. Therefore, it is the chop! On cutting and arranging them I was reminded of the Dutch craze for tulips in the seventeenth century and the many beautiful still life oil paintings of floral displays that included tulips. The above painting, ‘Flowers in a vase with shells and insects’, is by Balthasar van der Ast and now hangs in the National Gallery, London. Photographic reproductions do not do these type of paintings justice. With a close examination of the flowers in the painting I can clearly see an iris, some tulips, a rose, some carnations, a pale pink and white antirrhinum, and, more in the shadows a fritillary and a sprig of mauve lilac. I don’t grow carnations and I have lost all my snake’s head fritillaries as my soil is far too gritty and parched, but I’ve just been out in the garden (May Day) and located examples of flowers in the painting. Although some are by no means in full bloom and others have nearly gone over, the snap dragons (antirrhinum Night and Day) have not even started producing buds! We all know that the professional growers can keep flowering back or force it forwards, just think what they do for Chelsea each year, and I’m guessing some of these skills are centuries old. But we must not forget that however true to life a work of art may appear it is still the product of the artist’s creative interpretation. All those different flowers may or may not have been together in that pewter jug sometime in May 1630. And, this wouldn’t be a May Day post without a photo of the classic May-tree blossom – the hawthorn (Crataegus laevigata) – commonly used for garlands (outside the house only) for a traditional English May Day celebration.